My paternal aunt who prefers to have raw vegetables and fruits more than anything for her supper time, had prepared this salad at home when we visited her last month. 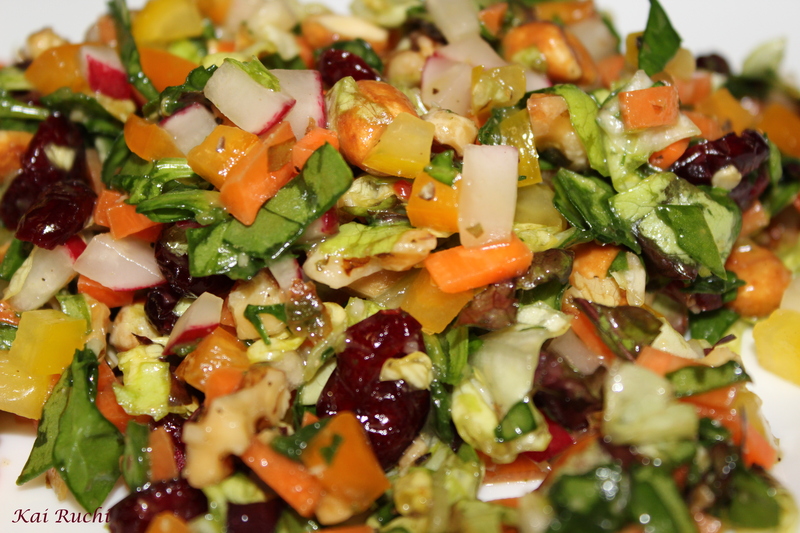 This salad is so refreshing and I love the way how she used so many vegetables into one salad. I was full after having this salad and felt wonderful. I usually make salads or soups everyday before having dinner, so this salad made a new entry into my list and I prepare this most often than any other salad! Finely chop the leafy vegetables. Mix everything in a bowl. Add chopped tofu, cranberries and mix well. Mix the dressing in a small bowl. Sprinkle salt, pepper and dressing according to your taste. Finally add the toasted walnuts and honey roasted groundnuts on top and serve immediately. What a gorgeous salad chock full of all the good stuff..(love the addition of baby beets especially)! I love salads. Just had a hearty bowl today that my daughter made with salad greens, watercress, and all yummy dressings. Superb mix of veggies! What else diver need after having a bowl of this healthy salad! 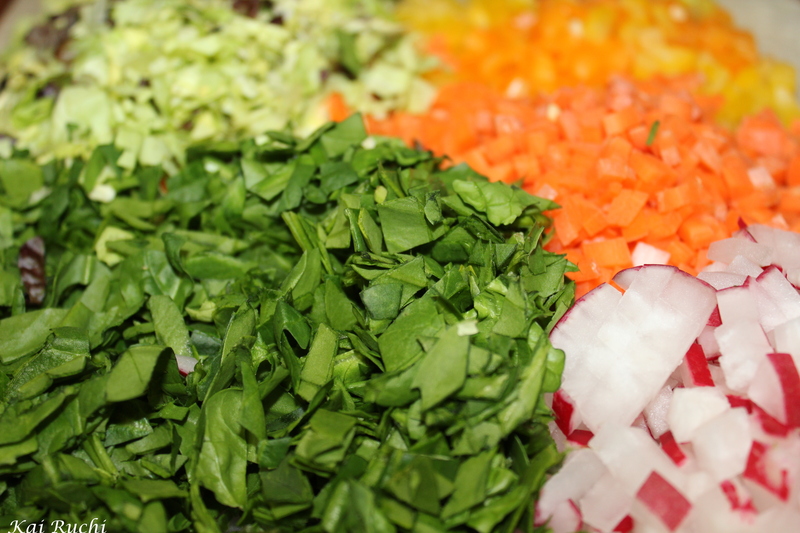 What a magnificent chopped salad! I love that you added cranberries….mmmmmmmm. Your aunt really knows how to eat healthy! What a beautiful and delicious salad. 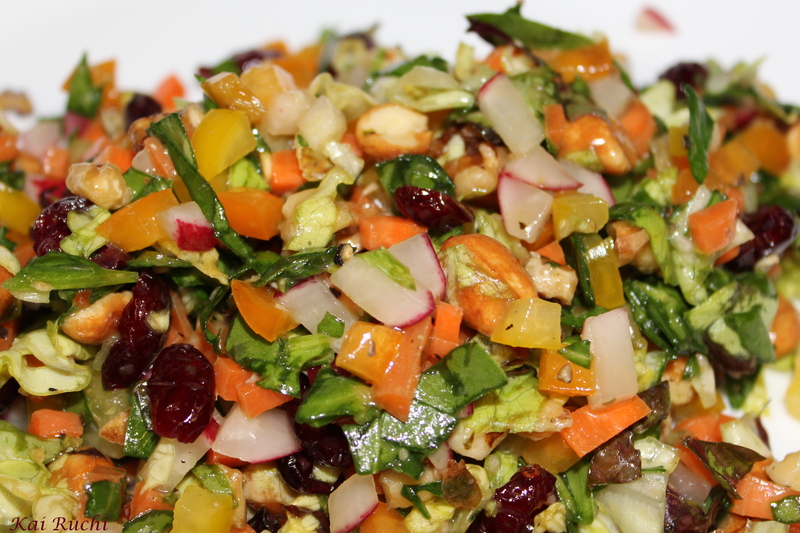 hubby is fan of salads..gotta try this one…looks so delicious and its healthy too..